It’s funny how a dish that’s been around for what seems like forever can suddenly catch on again, showing up on the pages of cookbooks and cooking magazines with renewed currency. Such has recently been the case with one of my all-time favorites (obsessions, really) — chicken parmigiana. 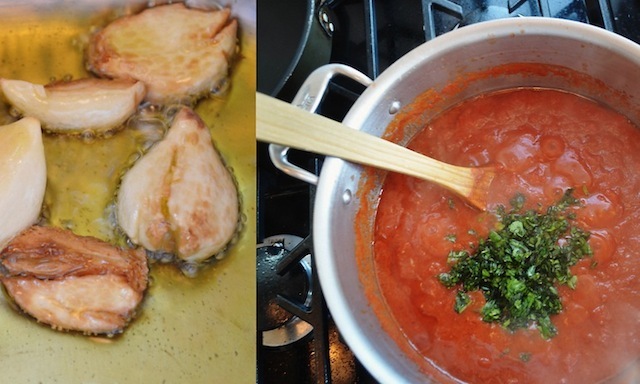 For years I’ve had a weakness for this Italian American classic, in large part because it features two of my favorite ingredients, tomato sauce and melted cheese, but also because both of these items lend themselves so well to a boneless chicken breast. Now even though chicken parm is something I could well have fallen in love with in my hometown of Philadelphia, and even though I got myself in front of plenty of Italian food in those days, it’s a dish I only came to appreciate when I moved to New York City. In fact, over the years it’s become for me the city’s Italian American signature. Which made it all the more surprising that what I was sampling at my local red sauce establishments was so underwhelming. Was it asking too much to be served a chicken breast that hadn’t been pummeled to the consistency of shoe leather, or a marinara sauce that didn’t taste as though it came straight from a jar? After all, this wasn’t a unicorn I was in search of — somewhere in my not so distant past I’d actually experienced a parm that had both a moist center and the sort of crackling exterior that’s the perfect partner to the slick of salty cheese that surrounds it. And then there’s the all-important topping: the one I remembered had the snap of fresh garlic and crushed tomatoes, which only served to amplify the various other flavors on the plate. That’s what I was looking for. So a little over a year ago I went on the hunt for a recipe, figuring I could make it better myself. I searched Epicurious, the various cooking magazines, my cookbook shelf — all the usual suspects — yet to my surprise none of the recipes I came across resembled the homey, full-bodied dish I knew and loved. Everything had been fancied-up or made more healthful. And then a few weeks later, as I was going through the monthly cooking magazines, there it was — in not one, but several of the books then on the newsstand. In other words, I wasn’t the only one looking to satisfy this particular craving. To my eye, the most promising was the version that appeared in the January, 2011 edition of Martha Stewart Living. The directions seemed manageable enough, and the corresponding photo of the finished product went right to the core of my red sauce loving heart. And so I got busy, gathering the necessary ingredients, then launching into the various steps involved in assembling the dish. The recipe promised a prep time of 40 minutes, and although I was busy pounding the chicken, making the sauce, and putting the whole thing together for well over an hour before even slipping it into the oven, it was a time commitment I was happy to make given the anticipated reward. Which proved to be the right attitude, as the result of my efforts was closer to my parm fantasy than anything else I’d sampled recently: the perfect ratio of cheese and sauce to chicken, a breast that retained just the right amount of moisture, and the ideal mix of cheeses. What’s more, my version looked just as alluring as MSL‘s — the ultimate chicken parm specimen (framed by a side of spaghetti, of course). But there were problems. For the requisite breading the directions suggested using day old bread, something I didn’t have on hand and wasn’t willing to wait for (I’d done enough of that, I figured), and so went with a fresh loaf, which yielded (duh) a moister, chunkier crumb than I wanted — something akin to the size of crumbled cornflakes. This proved a major drawback as it created a crust that was both too thick and too damp. For my second try I made sure I had a day old loaf to work with, and the results were far better — a light crunchy crust that held up beautifully under the weight of the cheese and sauce. That said, on subsequent outings I’ve also gone with packaged, unseasoned breadcrumbs, which had no discernable impact to the finished recipe, and which put considerably less pressure on the cook. (Hey, it’s always nice to know there’s a shortcut if you need one.) Either way, the key to making sure the coating adheres to the breasts is dredging them first in flour, then in an egg bath, before finally dragging the now thickened and somewhat gummy breasts through the breadcrumbs. 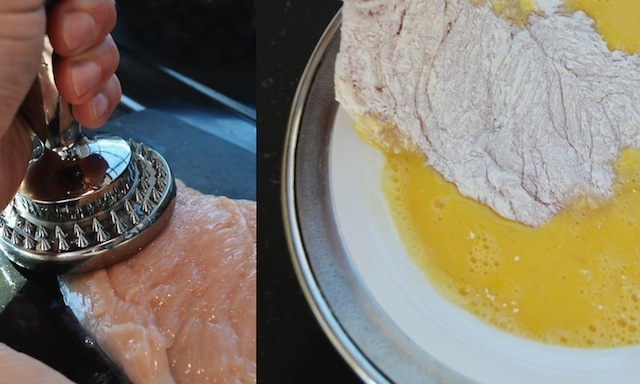 And just to make sure that precious breading doesn’t fall away when it starts to cook, be sure to let the mixture harden to the surface of the chicken for a half hour before it’s introduced to the sizzling oil in your frying pan. More importantly, however, I felt MSL’s sauce was both too thin in texture and too tame in flavor, lacking the kind of zing I look for in a marinara. As I tasted it, I kept thinking of the recipe I typically use when making spaghetti and meatballs, one that’s full of bite and body and that I felt certain would deliver exactly what this recipe was missing. So instead of running whole canned tomatoes through the food processer as MSL suggested, I simply bought a crushed variety (my favorite is San Marzano), which not only created a heartier sauce but shaved precious minutes off my cooking time. And to address the flavor issue, I increased the amount of garlic from 4 cloves to 6, smashing instead of slicing them. As for the herbs, I chopped the fresh basil instead of tearing it (the torn pieces never fully integrated into the MSL sauce), and opted for dried oregano instead of fresh, since this critical flavor hadn’t come through fully in the earlier version. 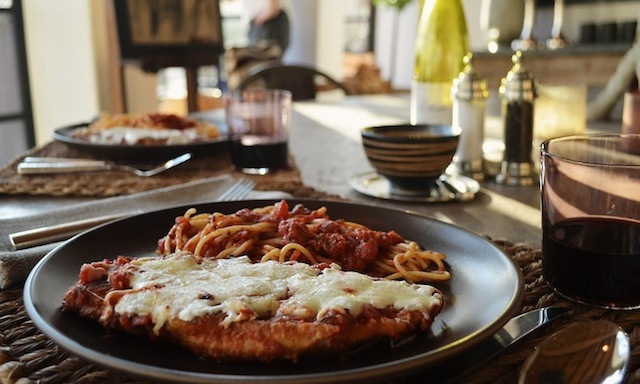 The results of all my tinkering: A crunchy, zesty chicken parm that delivers on all fronts. So even if I can’t find a chicken parm around New York that measures up to my lofty memory of the dish, at least I have a recipe in my arsenal that does. And now you have it, too. 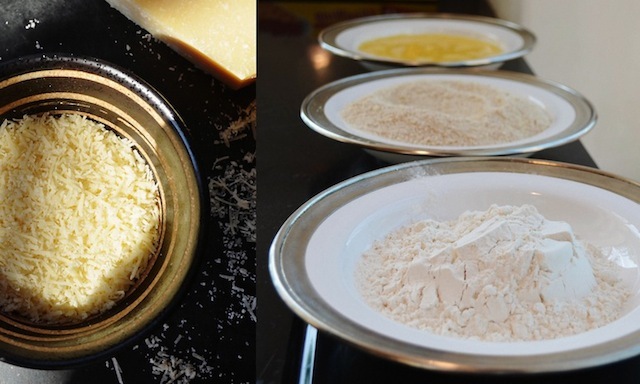 —Combine the breadcrumbs, Pecorino or Parmesan, ½ tsp salt, and some pepper. Put flour, eggs, and breadcrumb mixture in 3 separate dishes. Dredge cutlets in flour, shaking off the excess. Dip in egg, letting excess drip off. Dredge in breadcrumbs to coat. Let stand for 30 minutes. —Heat oil in a large straight-sided skillet over medium-high heat. (Oil is ready when a breadcrumb sizzles when dropped in.) Working in batches, fry cutlets until golden, 3 to 4 minutes per side. Transfer to a paper-towel lined baking sheet. 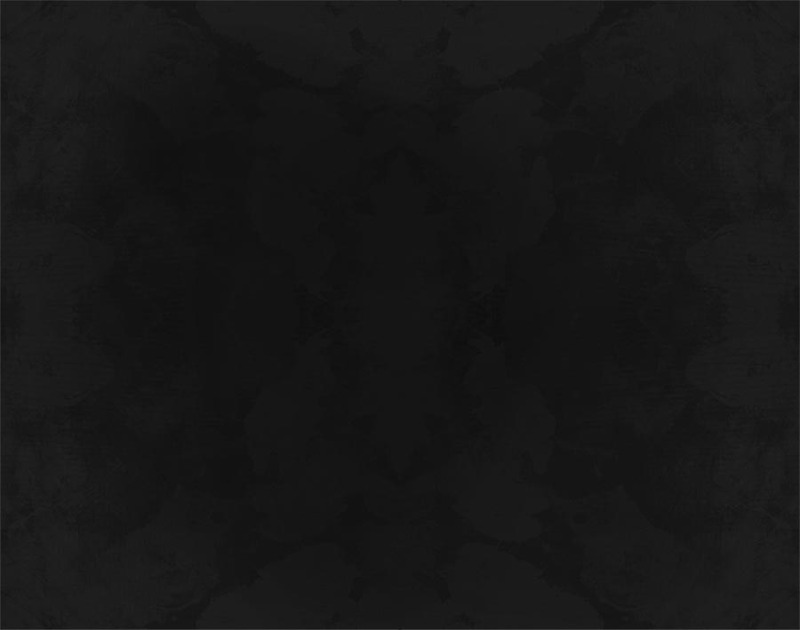 (If oil gets too dirty, discard, and heat an additional ¼ cup). —Heat oven to 375 degrees. 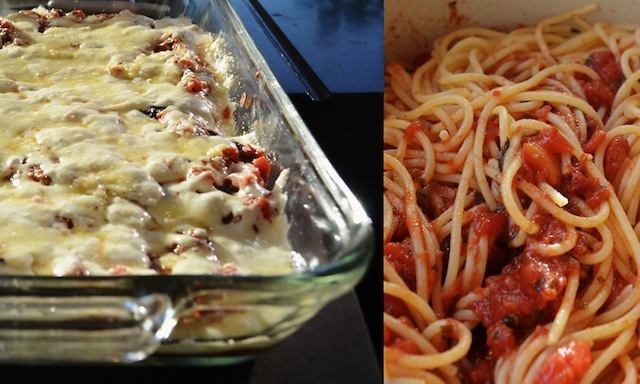 Spread ¾ cup marinara sauce (directions below) in the bottom of a 9” x 13” baking dish. Arrange a single layer of cutlets on top. Top with 1 cup sauce, covering each piece. Sprinkle with mozzarella and Pecorino or Parmesan. Cover with foil and bake until bubbling, about 10 minutes. 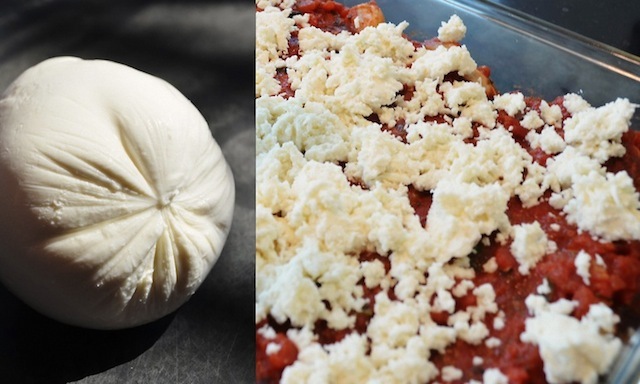 Uncover; bake until cheese melts, about 2 minutes more. 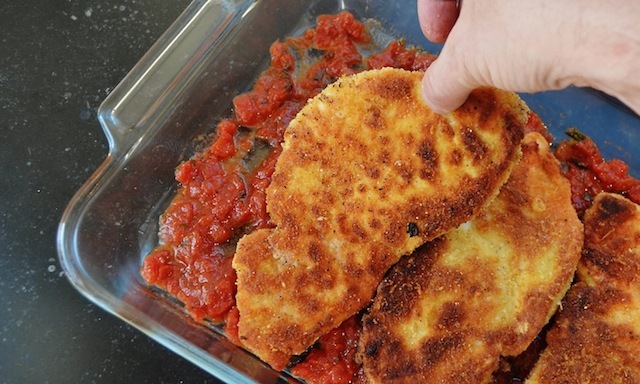 TRG’S suggested modifications: When frying the cutlets, I found 2 to 3 minutes was sufficient. Also, I needed slightly more sauce to cover the bottom of my baking dish and increased the amount from ¾ cup to 1 cup. Similarly, I needed 1½ cups of sauce to cover the cutlets, instead of the 1 cup listed. Lastly, once covered with foil and placed in the oven, I found it took 15 minutes, not 10, for the dish to achieve the desired bubbly results. 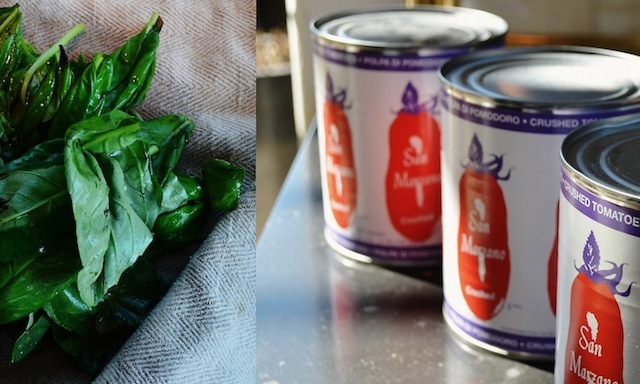 —In a 7 quart or larger saucepan, heat the oil on medium heat. Add the garlic and sauté until lightly golden brown, about 2 minutes. Add the tomatoes and salt. Bring to a boil, reduce the heat, and simmer, stirring occasionally, for 45 minutes to 1 hour; the sauce will reduce and thicken slightly but shouldn’t get too thick. Stir in the basil, pepper, and oregano. Hi Darlene— Yup, that's fresh mozzarella pictured (or at least, it was sold as such!). So glad to hear you're enjoying the site. I've been doing this for about eight months now and only just beginning to get feedback, so I'm really happy for the comments and question! I love chicken parmigiana, but this seems like the BEST chicken parmigiana. I am dying to try some of this mouthwatering dish!